“Yield (give way) to pedestrians at Zebra Crossing (crosswalk)!” -Traffic Police, Durbar Marg. Going by how traffic behave on the streets of Kathmandu, crosswalks, marked with white lines, could be better characterized as whites lies! Secondly, to pedestrians, far from being able to cross them confidently and safely — naturally because of the kind of drivers we have — it’s a place where they seriously ponder: “To live, or not to live: that is the question!” Giving into their survival instinct, they yield…to TRAFFIC! 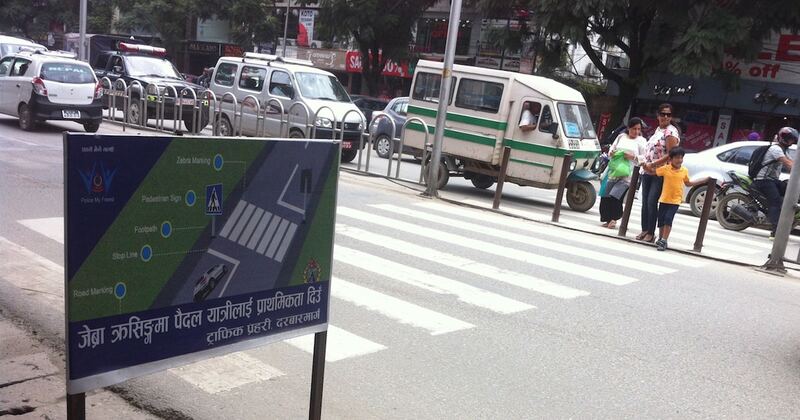 In other words, all indications are that those white lines in Kathmandu don’t mean — and represent — what they do! What otherwise is the explanation for drivers in Kathmandu going at pedestrians menacingly — often accompanied with honking — and forcing them to yield so that they can pass from in FRONT of them?! What?! Or, what explains their tendencies to stop ON — instead of behind — crosswalks as often and nonchalantly as they do all over the city?! Really, what?! And if the meters or minutes they gain on a few — or some — of their “competitors” is what drives them (excuse the pun) to pit themselves against every single other driver and even pedestrians — which actually merely leads to their being late to everything, pretty much every single time — what is the point, right?! It’s a given that if you and the MAJORITY looks out ONLY just for themselves, ignoring all traffic rules and regulations and taking pretty big risks just to get ahead of those around you, then EVERYONE suffers, including YOU! Of course, being mindful of pedestrians on crosswalks (or anywhere else for that matter) and adjusting your driving to accommodate them to ensure their safety is NOT rocket science! The Vietnamese in the video below (most likely in Ho Chi Min City) make it look really really easy…and it is! Look how effortlessly traffic approaching the crosswalk make the necessary adjustment to go around from BEHIND the pedestrian! I can confirm that that indeed is how it is in HCMC because I lived in the city for a whole year and learned to cross roads — just as they do in the video — not long after I arrived in the city. If you watched the video, I’m sure you’ll agree with me when I say street-crossing in HCMC LOOKS pretty scary and unsafe, possibly even scarier than in Kathmandu! But, believe me when I say this: it definitely is NOT! The mantra? Just. Walk. At. A. Steady. Pace. That’s it! When drivers in #Nepal learn to drive around BEHIND the pedestrians crossing the road, THEN we’ill get somewhere as a country…me thinks! Because, that, to me, will indicate that, firstly, drivers in Kathmandu know and respect traffic rules and, secondly, that people in Kathmandu have become considerably more civilized in general! That they have lost that “Me me me me me” mentality! If only d Nepalese did everything they cud 2 pass ppl/countries ahead of them as they do vehicles in front of them while driving…if only! If only the Nepalese did that instead and abandoned their “khutta tanne pravirti” — the tendency to pull down those perceived to have gotten “ahead” — just imagine where we would be, where we as a people and nation could be!